One of the biggest things I have learned during our healthy lifestyle transition is that food can be used as fuel. Depending on what I eat throughout the day or the night before a workout always effects my performance. For meals throughout the day I typically have breakfast, mid-morning snack, lunch, afternoon snack, dinner, and occasionally a post-dinner snack if there are still calories left in the day. This is an example of an afternoon snack before working out. The potassium of the banana and the combination of carbs from the low-calorie bread always gives me fuel to run strong. The peanut butter is delicious and really helps to boast the powerful effects of the snack. I am thankful to know what foods make me feel my best when working out. I’ll tell you what- working out after eating a cupcake or brownie never has the same effects that I get when I work out after eating this Elvis-style snack. 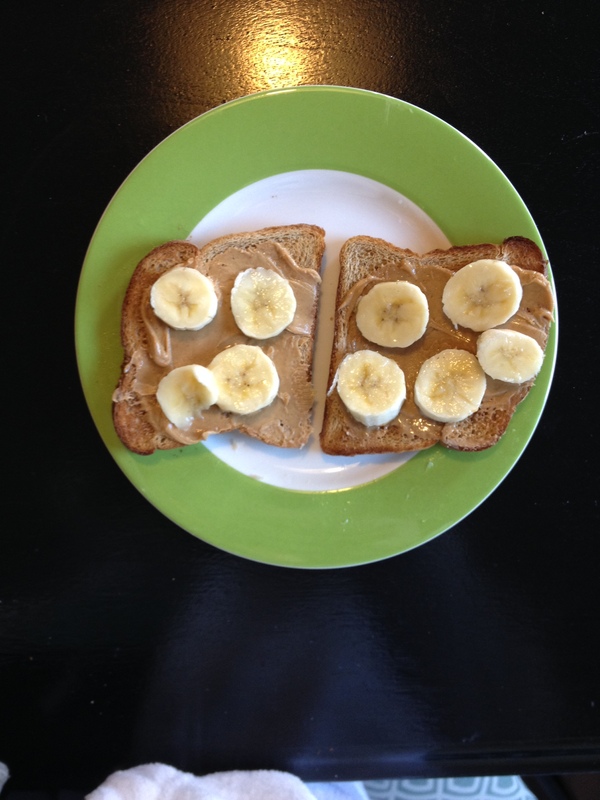 What are you snacking on before your work outs? This entry was posted in Married Life and tagged fitness, food, healthy lifestyle. Bookmark the permalink.